The windshield wipers on your vehicle are a safety feature. They assist with keeping your windshield clean and clear so you can see the roadway. Bad wiper blades can leave streaks, smudges or smears that reduce visibility and put you and your passengers at risk. This is why it is important to change your wipers on a regular basis and to recognize the signs and signals that your blades need to be replaced. In general, your wiper blades should be replaced every 6 to 12 months, but summer heat can reduce their longevity. It is a better idea to simply inspect your blades and replace them when they need it. You will want to pay attention mainly to how they clean your windshield. If you notice they are not doing a good job anymore, then it is time for a replacement. Also, watch out for any odd noises, which can indicate the blades are not moving smoothly across the glass. Physically check out the wiper blades. Look at the frame to see if there are signs that it is bent or broken. Look at the blades for signs of warping, cracking or missing rubber. Make sure the wiper blade is still flexible, too. There are many things that will signal to you that your wipers need to be replaced. Understanding the causes can help you to better spot a problem and get the wipers replaced before they cause trouble when you are on the road. For example, streaking is usually caused by dried-out blades. You can check for this by looking at the blades and feeling the rubber. If it is hard and cracked, then you need new ones. However, it may also be caused by other issues. Your blades may be covered by pollen, for instance. In that case, you just need to clean the blades to stop the streaking. Uneven wiping is another issue. This could be caused by blades that are worn unevenly. This is often caused by a bent wiper frame. In this case, you would need a new frame and wiper blade to fix the problem. Windshield wiper blades will wear naturally over time. However, wear can be accelerated by some natural and unnatural causes. The sun, for example, is very harsh on blades. The heat and lack of moisture cause them to dry out, which leads to cracking and breaking. This is usually not something you can prevent unless you are able to keep your vehicle out of the sun. Wax or oil that you use on your vehicle can also harm your blades and cause the rubber to break down prematurely. Salt in the air also degrades the wiper blades more quickly. To help prevent early wear, make sure you clean your windshield often, don’t use the wipers to clear frost from the windshield and make sure to always pop your wipers out so they aren’t coming in contact with substances you may use on your vehicle. 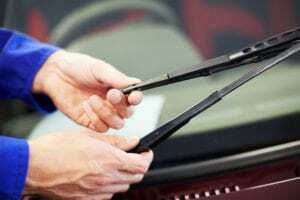 When it comes to replacing your windshield wiper blades, you need to make sure that you keep them in good shape. Bad blades can lead to visibility issues during the upcoming monsoon season and put your safety at risk.